The Central Asian Republic of Kyrgyzstan achieved its independence in 1991, following the collapse of the Soviet Union. With two thirds of its territory covered by mountains and only one third suitable for agriculture, it used to be one of the smallest republics of the Soviet Union yet inhabited by people belonging to more than eighty different nationalities. 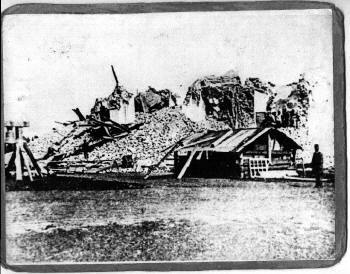 A Street in the Jewish Neighborhood of Osh after the earthquake of 1926. Kyrgyzstan, also know by its Russian name as Kyrgyzia, has been named after the local Kyrgyz tribes of Mongol origin whose ancestors came from the territory of contemporary China in 13th century CE. Previously, the lands of Kyrgyzstan were part of the Turk Khanate between the 6th and 12th centuries CE; then from the 13th to the 16th centuries Kyrgyzstan was ruled by Tataro-Mongols; it was part of the Kokand Khanate throughout the 17th-18th centuries and after the mid 19th century, it became an integral part of the Russian Empire. Today Kyrgyzstan is bordered to the north, west and south by the Central Asian republics of Kazakhstan, Uzbekistan, and Tajikistan, respectively and by China to the east. For a long period, Kyrgyzstan was an important station on the Silk Road. Numerous traders of different nationalities and religions drove their caravans to China and India through the Kyrgyz territory. Many of them decided to settle in small trading centers and villages that flourished along the Silk Road. Archeological evidence discovered by the Kyrgyz Academy of Science suggests that Jewish traders from Khazaria started visiting the Kyrgyz territory about the end of the 6th century CE. In Kyrgyz tradition, the term dzeet (Jew) is found for the first time in the Kyrgyz national epic poem Manas, which dates back to the 10th century CE and probably incorporates earlier traditions. Manas, the name of a town and oasis in central Xinjiang Province in the modern Uighur Autonomous Region of China, is also the name of the legendary epic hero of the Kyrgyz people, described as a son of Jakup – Yaacov. Manas mentions several cities with sizeable Jewish communities, among them Samarqand, Bukhara and Baghdad, as well as various places in the Middle East, including Jerusalem which is described as a “Holy City for Jews”. An entire section of the poem is dedicated to “King Solomon’s times” (Sulaimandyn Tushunda)1. It should be pointed out that the cult of King Solomon remains very popular in Kyrgyzstan even today. Several popular Kyrgyz legends refer to a 130 meters high mountain near the city of Osh by the name of ‘King Solomon’s throne’ (Takht-i-Sulaiman). According to a Kyrgyz legend, one night God took King Solomon to that mountain, which local Jews with time came to revere and compare with Mount Zion. Since the 8th century CE, the Star of David symbol has been used frequently as an ornamental element in Kyrgyz architecture and crafts. Incidentally, according to the Kyrgyz tradition, Adam is considered the father of sewing and weaving, Noah – of architecture and carpentry, David – of metallurgy and tinwork, and Abraham – of barbers. In the Suzak region of Kyrgyzstan there is a village named Safar, a name thought to be a variant of ‘Sephard’, i.e. the place inhabited by Jews of Sephardic origin. During all years of its history in Kyrgyzstan, the Jewish population never reached more than 2% of the region’s population: according to the population census held by the Tsarist authorities in 1896 Jews represented 2% of the total population of the region; and that figure was also the result of the census organized by the Soviet authorities in 1926. During the years of WW2 the number of Jews was higher but it included also many temporary residents, after WW2 the percentage of the Jewish population began to decline and in the early 2001 the Jews represented only 0.03 percent of the total population. Jews began to settle in the cities located along the Great Silk Road since the 4th century CE. For the most part, they were traders who spoke and wrote in Aramaic. In his memoirs Marco Polo, who passed through the territory of Kyrgyzstan during his voyage to China, mentioned numerous Jewish communities along the Silk Road and in China, where Jews were called the “people with colored eyes” and were allowed to build synagogues. According to the Russian researcher Vladimir Bartold, during the 10th century the Jewish population in the eastern regions of Iran was larger than that of the Christians. Khorezm, Osh, Kokand and Samarqand hosted famous communities of Jewish scholars who called themselves khabr, an Uzbek word derived from the Hebrew haver (“friend, colleague”) which they used to distinguish themselves from the “commoners”2. The famous Arab geographer Al-Maqdisi (946-1000), who traveled extensively in the lands of Islam, mentioned the cities of Osh, Balasagun, Uzgen, Taraz and others as having communities of akhl-az-zimma (non-Moslems, mostly medieval Jewish traders). These Jews were of Middle Eastern origin and habitually were active as traders, moneychangers and bankers. Some geographical information about the Silk Road, particularly names of towns, reached even Spain: the famous atlas compiled by Abraham Crescas in Palma de Majorca, Catalonia, in 1375-77 contains a map of Kyrgyzstan with the lake Issyk-Kul and the cities of Talas and Jerusalem as a holy city for Jews. At the end of the 18th century, a special Imperial law gave permission to affluent Central Asian merchants to become members of trade corporations in the Russian Empire. As a rule, these traders in addition to their commercial activity carried special diplomatic and espionage missions. Moses Raphailov, a merchant from the Kashghar region (at the time Kyrgyzstan was a part of Kashgharia), collected important strategic information for the Russian government and subsequently was awarded in 1811 an important gold medal for his ‘special contribution to the prosperity of the Russian Government’. At the beginning of the 19th century, there were about 19.000 Jews, all following Sephardi traditions, living in Central Asia3. They were divided among speakers of a dialect of Persian descending from the earliest Jews that settled in this region, and Bukharian Jews who primarily speak a dialect of Uzbek, although in order to communicate both groups use equally the two languages. Both groups found themselves quite often as subjects of one ruler and sometimes of several rulers, like the Bukharian Khanate and the Kokand Emirate in 18th-19th centuries. The majority of Jews lived in the territories of the Khiva, Kokand and Bukharian Khanates with tiny numbers scattered in small communities in the countryside. The first Ashkenazi Jews began to arrive in the region after the conquest of Central Asia by the Russians, some of them arriving with the Russian army as kantonists (Jewish youths conscripted by force to the Russian Imperial army and forced to convert to Christianity, nevertheless some returned to Judaism after discharge from the army). 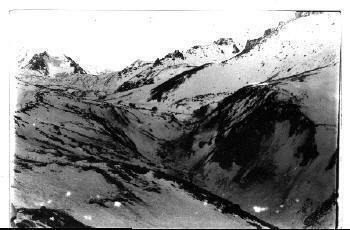 Anempodist Varaskin (1820-1878), a famous geographer and cartographer, himself a former kantonist, investigated the region and drew maps of the northern Tien Shan Mountains, the Balkhash region and the Chu Valley. Ashkenazi Jews settled mostly in the provincial cities of Kyrgyzstan and became an inseparable part of the urban culture of the region. In the city of Karakol (formerly Przhevalsk), in eastern Kyrgyzstan, just one Jew was recorded in 1885, in 1900 there were seven Jews, their number grew to fifteen in 1903 and in 1910 the city had thirty-one Jewish inhabitants. In 1885, there were in Bishkek eight Jews, but in 1913 the city numbered forty-two Jewish residents4. In the city of Osh Jews of Ashkenazi and Sephardi origin lived separately. Ashkenazi Jews dwelled in the new, ‘European’ part of the city along with Russians and Tatars, while Sephardi Jews, only some of them considered subjects of the Russian Empire while the others were regarded as subjects of ‘foreign states’ inhabited the old district of Osh. Everyday life of Sephardi Jews was very much alike to that of their Moslem neighbors: they built their houses in the Uzbek style, consumed similar food and dress in similar cloths, but lived in separate communities from the local Uzbek or Persian inhabitants. According to the Report of the Local Authorities compiled by the Governor-general of Turkestan at the request of the central Tsarist authorities, in 1898 the largest Jewish community lived in the Osh region of Kyrgyzstan. Practically all Jews were city residents since the national policy of the Russian Empire forbade Jews from settling in villages. There was a separate Jewish cemetery near Osh. The ground for the cemetery was purchased from the local population in the 1880s, as it was difficult to bury Jews in their ‘historical motherland’: Fergana, Samarkand or Bukhara. There were numerous Jews among the owners of different enterprisers and companies in the territory of Kyrgyzstan. Yuri Davidov owned cotton factories in the Fergana Valley, Boris Kagan established a network of bookshops, the Polyakov brothers founded a branch of the “Azov-Don Commercial Bank”. Already in the late years of the 19th century, I.M. Singer & Company, the famous American sewing machines manufacturer founded by Isaac Merritt Singer, opened shops in the territory of Kyrgyzstan as a result of the gradual development of the Fergana Valley into a center of cotton textile industry based on the local agricultural production. According to the decree On Religious Tolerance, issued in 1905, members of non-Christian religions were permitted to settle in various parts of the Russian Empire. Kyrgyzstan, a remote region of the Russian Empire that was in great demand for doctors, engineers, teachers and qualified artisans attracted Jewish immigrants from Poland and Lithuania as well as from Iran and Iraq. Not much is known about the religious life of the Jews of Kyrgyzstan before the Bolshevik Revolution of 1917. The Jewish community of Osh bought their phylacteries and Torah scrolls from Bukhara. 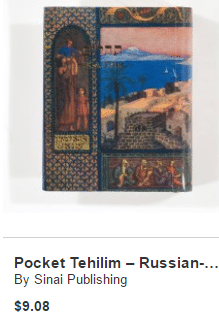 Some religious books, mostly editions of Torah and the Babylonian Talmud with commentaries in the Jewish dialects of Persian or Uzbek languages were published in Kyrgyzstan in the early 20th century. Until 1915, there were no synagogues in Kyrgyzstan. The nearest synagogues were in Vernyi (now Almaty in Kazakhstan), Tashkent, Samarkand, and Fergana (now in Uzbekistan). Local Jews used to gather for prayer in the houses of local rabbis. The officials of the hevra kadisha (funeral association) were sent to Kyrgyzstan from Kazakhstan and Uzbekistan. 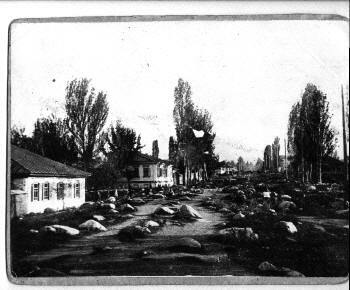 A separate Jewish cemetery existed only in Osh, in Bishkek where was a distinct Jewish burial section in the local Muslim cemetery, while in other cities Jews preferred to use separate Jewish sections in Christian cemeteries. There was no primary Jewish education for the Jews of Kyrgyzstan. Some Sephardi Jews sent their children to heder in Samarkand, Ashkenazi Jews kept Jewish traditions only within the family and sent their children to Russian educational institutions. In 1910, the Governor General of Turkistan classified the Jews of Kyrgyzstan in seven categories: 1) local Jews; 2) Bukharan Jews who became Russian citizens; 3) Jewish migrants from various parts of the Russian Empire; 4) Jews who arrived in the frames of educational census; 5) Bukharan and other Central Asian Jews who were not Russian citizens and had a status of temporary residents; 6) Jews willing to get the status of local Jew and had asked for permission from the Tsarist authorities; 7) other Jews who had temporary ‘business’ status. The population census conducted in the General Governorship of Turkistan in 1900 mentions among the city-dwellers of the region 400 Jews in Tashkent, 2300 Jews in Fergana, 4560 Jews in Samarqand, 800 Jews in Osh and 250 in Bishkek, the last two localities within the current borders of Kyrgyzstan. 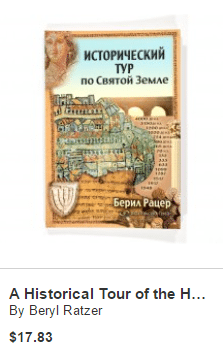 Of the cultural life of the Jews of Kyrgyzstan, a special mention should be made of the publishing house established by Pinkas Lipshits, a former book trader who settled in Bishkek. He published not only religious literature – mainly in Hebrew with commentaries in Yiddish or Russian – but also works by Tolstoy, Goethe, and Shakespeare in Yiddish translations from Russian. The first gramophone recordings of Sephardi Jews were made in 1910. The Sephardi Jews published Rahamim, a newspaper that appeared in Fergana and Kokand, while Ashkenazi Jews established in Kokand the Tarbut cultural-educational association with branches all over the territory of Central Asia. A Yiddish theatre company was one of the activities promoted by this association. After the start of WW1 there were some changes in the status of the Jews in Kyrgyzstan. More Ashkenazi Jews arrived in the region: among them were representatives of different political parties and movements that had been exiled to Central Asia. In Kyrgyzstan, there were activists of the Socialist Revolutionaries (SR), Social Democrats, the Bund, and the Peasants Group. However, in general the Jewish population was not involved in politics. Ashkenazi Jews especially, who mostly were city dwellers and belonged to the middle class, had few motives to seek a change in their status. The situation of the Sephardi Jews was completely different. According to the law on Military Reservists, all native “non-Slavic local population” which according to the Tsarist authorities included the Sephardi Jews, was mobilized for hard technical and manual labor on the battlefronts of WW1. While wealthy Uzbeks, Tajiks and Kyrgyz used to pay poor members of their communities to be sent in their place, this policy of “replacement” was strictly forbidden by the leaders of both the Sephardi and Bukharian Jews, moreover Sephardi Jews could not pay to non-Jews to take their place. Local authorities informed the central government that many Jews flew to Afghanistan and sprayed disinformation on the “patriotic spirit” of the Russian soldiers there. The local population of Turkestan was disappointed by the policy of Russian authorities towards the national minorities and they simply rebelled and refused to fulfill their military duties. 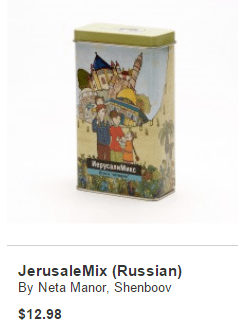 It is interesting to note that the local Muslim opposition accepted Sephardi Jews as a genuine anti-Russian element, while Ashkenazi Jews were perceived as an “alien” element completely supporting the Russian colonial policy. By 1916 some Jews of the hundreds of thousands of Jewish war refugees and POW from the German and Austro-Hungarian armies were sent to Kyrgyzstan where they were compelled to work in coalmines, irrigation projects, railway routes and as technical personnel in the local factories. Following the Bolshevik Revolution of 1917, new political activists arrived in Kyrgyzstan, of them many were Communists with a Jewish origin or background: G. Broido was chairman of the Bishkek City Soviet; while Pinhasov, Lifshits, and Frei were members of the local City Soviets in Osh, Dzhalal-Abad, and Tokmak, respectively. They all were persecuted during the Stalinist purges of the 1930s. In 1920, at the initiative of the local Ministry of Education a Jewish Institute with the aim of “liquidating the illiteracy” was set up in Kyrgyzstan under the leadership of Simon Dimanshtein, who later was instrumental in organizing the Jewish settlement in Birobidzhan. The Institute organized circles and clubs for the alphabetization of Sephardi Jews and established a network of primary schools intended at preserving their unique culture and language – mainly dialects of Persian and Uzbek languages which were spoken by Sephardi Jews. A network of technical colleges was supposed to create a “new type” of Soviet Sephardi Jews: factory workers and schoolteachers, instead of shop owners and money dealers. During 1920-1940, some 750 books in the Persian-Jewish language and one newspaper were published by the Soviet authorities in Osh, Bishkek, and Dzhalal-Abad, especially by UchPedGiz (The Educational Study Publishing House) that encouraged the printing of books, particularly textbooks, in the languages of national minorities. A branch of the Militant Atheist-Marxist Association was established in Kyrgyzstan in 1929 by the Soviets. More than 1,880 clerics – priests, rabbis and mullahs – were denied their electoral rights. Nevertheless, Jews attempted to observe Jewish religious traditions in secret. For the Passover holiday, each family used to bake matzoth at home; several families met together and celebrated the Sabbath and holidays. Circumcision too, was practiced clandestinely; a number of families organized a ceremony and paid for a mohel who was specially brought to Kyrgyzstan from Tashkent, in neighboring Uzbekistan. Alexander Volodarsky, a former yeshiva student in Vitebsk, having been exiled from Byelorussia because of his religious beliefs, became a well-known unofficial leader of the Jewish community in the city of Osh. Volodarsky acted as shochet and was regarded as an authority on kashrut. He repeatedly appealed the city authorities with requests for setting up a separate section for Jewish burial in the cemetery of Osh and thanks to his endeavors, the members of the Jewish community of Osh were allowed to be buried in a separate Jewish section until the beginning of WW2. Ashkenazi and Sephardi Jews collected money jointly for the maintenance of the Jewish tombs. Of the prominent Jews of Kyrgyzstan a special mention should be made of the historian Zalman Amitin-Shapiro (1894-1944). Son of a rabbi, he graduated simultaneously the Faculty of Law and the Faculty of Oriental Studies of the Turkestan University. He is the author of a number of studies on the history of the Jews of Bukhara in Kyrgyzstan: Women at a Wedding Ceremony of the Bukharian Jews of Turkestan (1924), Common law of the Bukharian Jewish Communities (1926), On the Practice of Socialization among the Bukharian Jews of Turkestan (1933). In 1937, he was named Professor of Ancient History at the State Education Institute of Kyrgyzstan, but a year layer he was arrested under the accusation of being an “enemy of the people” and exiled to Siberia, where he died in 1944. During WW2, more than 20,000 Jews who fled from the Nazi occupied western territories of the Soviet Union were resettled in the cities and villages of Kyrgyzstan. The life of Jews resettled in the countryside was particularly difficult as they lacked any previous experience of agricultural labor. In Soviet villages, wages were paid according to the number of “working days”. As a “working day” was measured by the quantity of the harvested agricultural products, only people familiar with agricultural work were able to fulfill the norm and consequently many Jews were rewarded salaries that barely enabled them to survive. The local population’s attitude towards Jewish refugees was rather suspicious and they generally regarded the newly arrived Jews as having an experience of the “Western capitalist way of life”. Several Jews were arrested for their alleged “counterrevolutionary activity” and “spreading of lies about the bourgeois way of life”. The Jewish Theatre Company of Warsaw with the renowned actress Ida Kaminska (1899 – 1980) was evacuated to Kyrgyzstan during WW2. The Jewish theatre performed in Yiddish, Polish, Ukrainian and Byelorussian, before returning to Poland after the war. The hardships of WW2 brought about a change in the official policy concerning the relationship between state and religion. The Soviet policy during those years assumed that every religion had an important duty in the consolidation of the Soviet society facing the German enemy. In 1941, a public synagogue in Kyrgyzstan was allowed for the first time to be opened in Bishkek (then known as Frunze). Jews bought a building in the city center and Y. Levin, the first rabbi, donated a Torah scroll. The synagogue provided services of mohel, shochet and hevra kadisha. A beth midrash and a mikve functioned on the premises. Special shops selling kosher meat, haloth for Sabbath and matzoth for Passover opened near the synagogue. Additional synagogues were established in the cities of Osh and Kant. The Jewish religious community of Bishkek gained official recognition in 1945. At the time, some 70 Jews visited the synagogue daily, while on Sabbath there were more than 200 worshipers. During the holidays, especially on Yom Kippur, more than 2,500 Jews went to the synagogue, among them some 600 women and young persons under the age of 30. Later on, the Bishkek synagogue provided services for Sephardi Jews as well. Separate prayers for Ashkenazi and Sephardi Jews ended only in the early 1990s. The Jewish community of Bishkek was permitted to celebrate officially Jewish holidays such as Rosh-HaShana, Yom Kippur, Pesach and Shavuot, however, in the early 1950s, except during the holidays, all other religious activities were forbidden. Despite the negative attitude of the Soviet authorities, members of the Jewish communities of Bishkek, Osh, and Dzhalal-Abad secretly collected polkhaya – money, food, and clothes for the needy families and sick people, as well as funds for the synagogues. During the 1950s, the Jewish population of Bishkek reached 3% of the total city population. After WW2 Ashkenazi and Sephardi communities continued their separate frameworks. Intermarriages between Ashkenazi and Sephardi Jews were rather an exception than the rule. The rate of marriages with non-Jews represented 5% to 10% inside both communities. Higher education was more common among Ashkenazi than Sephardi Jews who were employed as bakers, shoemakers, barbers, butchers since childhood. Occasionally, Jews represented as much as 80% of the young specialists that were sent from the central regions of the Soviet Union to the Central Asian republics in order to strengthen the local cadres and help them develop the Socialist culture, science and industry. According to the population census of 1959, there were 5,800 Jews in Bishkek and thirty years later, they numbered 5,200, of them 311 declared to be Sephardi5. During the 1970s, many Jews identified themselves as atheists, but visited the synagogue regularly as a way to maintain their ties with other community members.